"Lets join our hands and help those who have been affected by the cyclone. No donation is too small to make a change. Anything you think can assist those in need right now in Chimanimani please bring it over. "For those with direct access, please send your donations over to Chimanimani. (But) for those who are willing but do not know how to get the stuff there, feel free to bring them over to 31 Hebert Chitepo in Belvedere," wrote Jah Prayzah. The "Mdhara Vachauya" hitmaker will be delivering donations in the disaster struck areas. 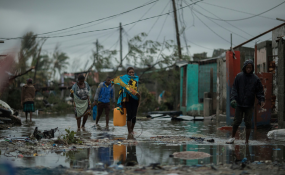 "Our hearts and prayers go out to those affected by the cyclone Idai. The scenes are saddening but we know that there is Hope in the God we pray to. "The relief that comes from Him is permanent and we stand with them during this devastating season."